There was nothing Chase could do to avoid wrecking with Hamlin's car pushing his into a corner. Hamlin could have avoided wrecking by lifting his left foot as he went up the hill toward the wall, or by pitting after wall contact to change tires. 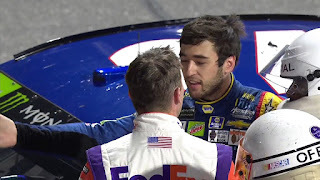 If Chase had raced Hamlin the way Hamlin raced Chase, then he would have pushed Hamlin into a the corner with his back tires half off the ground and zero control over his own fate. 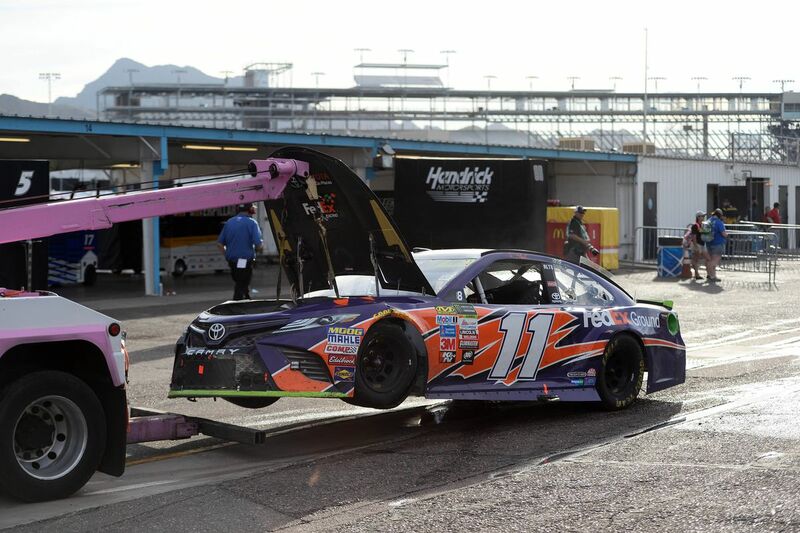 As it was, Hamlin's wreck that took him out was all by himself, because he and his team chose not to change tires. When you live by the sword, you die by the sword. Simply put, what goes around, comes around. Very nice piece you posted on your Facebook page Dave, I agree with you ��% on what you wrote in your article, I wish people would see and read what you have written, it would be a huge eye opener for all the fans of NASCAR, I don't understand some of the comments and what some of the callers say that call your show, if they'd read what you write they would come in alot more educated on what they call they're NASCAR!!!!! Love the piece, I will be reading often!!!! Thank you sir!!!! very good article you wrote, You know this is not the first time Denny has mustered up some hate and discontent, remember him wrecking Joey in Calif and the week before that he wrecked him at Bristol, Yes, Denny can drive a car well, but his head will keep him from winning a champinship as it already has, He wrecks too many people. 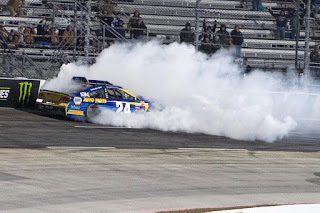 I think the reason fans booed Hamlin and had such a fit when he wrecked Chase is they viewed as a dastardly thing to do. When Dale Sr. "Rattled Labonte's cage" a lil too hard years ago at Bristol he was vehemently booed from the stands. I had never seen Sr. Look so sheepish during his interview. The mighty Dale had crossed the line. I don't believe fans are entirely fickle when it comes to hard racing and I believe my example proves it. Elliot's actions on Sunday were resoundly cheered I believe because he did it right. Payback...absolutely! Properly executed....magnificent! Dastardly...not even close. Fans can deal with hard racing, but hard racing poorly disguised as an accident. Never. Just my take. 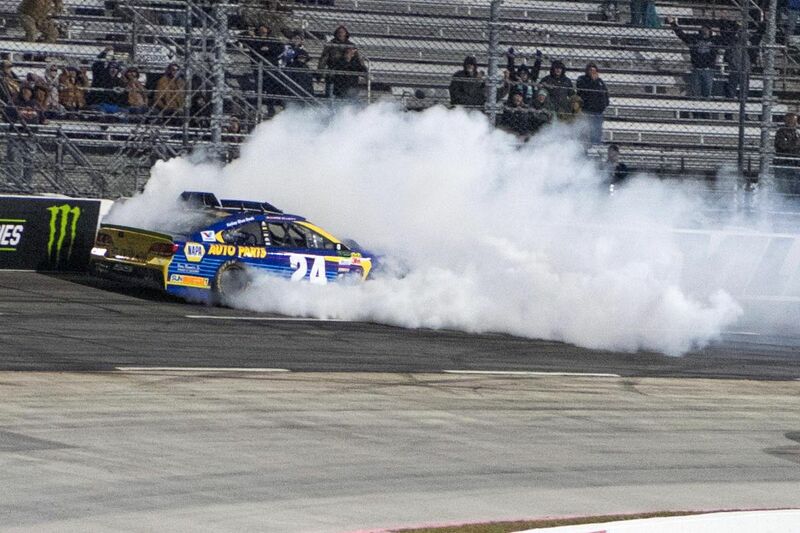 As much as Hamlin has raced at this level I think he would have raced Chase differently in Martinsville. When you get to Phoenix I wonder if Chase could have gotten by Hamlin quicker, then Kenseth may have not caught Chase. I look at that Hamlin actually cost Chase 2 races. How many times did Chase actually bump Hamlin. Hamlin's spotter is just plane wrong. Hamlin was not letting Chase by.